Throughout the course of the past few years, OakLeaf Services engaged in a comprehensive transformation process. After receiving a grant for professional on-going support of the initiative, OakLeaf fully embraced the need for true community integration and community employment for individuals with disabilities. 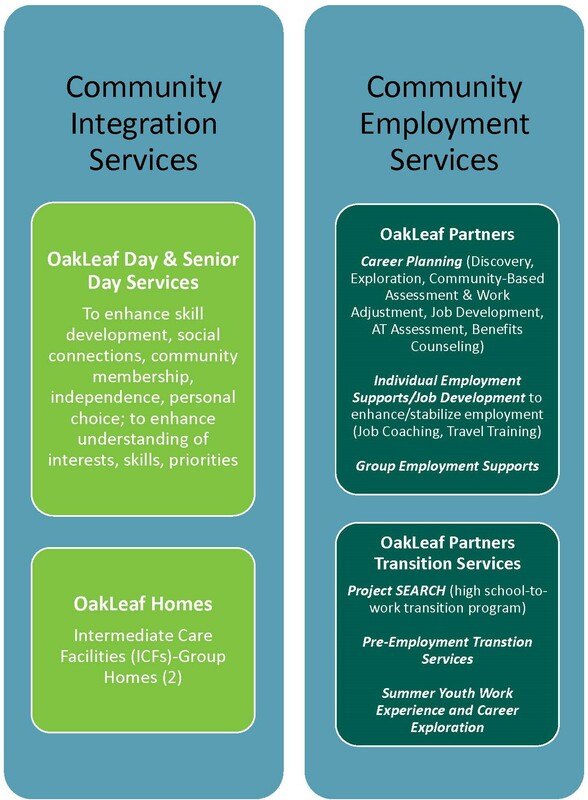 At the end of 2018, OakLeaf made the strategic decision to refine our organizational structure and divide the department into two core groups: Community Integration and Community Employment. We have been working even more frequently with our consumers to clearly define their goals in order to assist in their move forward to more integrated and less restrictive environments. Simply put, individuals who desire learning more and moving towards work in the community will be part of Community Employment, and individuals who have different goals and needs will be part of Community Integration. It’s important to note that community integration does not just mean taking a trip to the store or the park. When we talk about meaningful community integration for someone with a significant disability, we want them to be an active participant in their community, possibly by volunteering, joining an interest group or class, etc. The OakLeaf team is dedicated to ensuring that adults with disabilities are able to live the highest quality, most productive life possible while achieving maximum integration and independence.